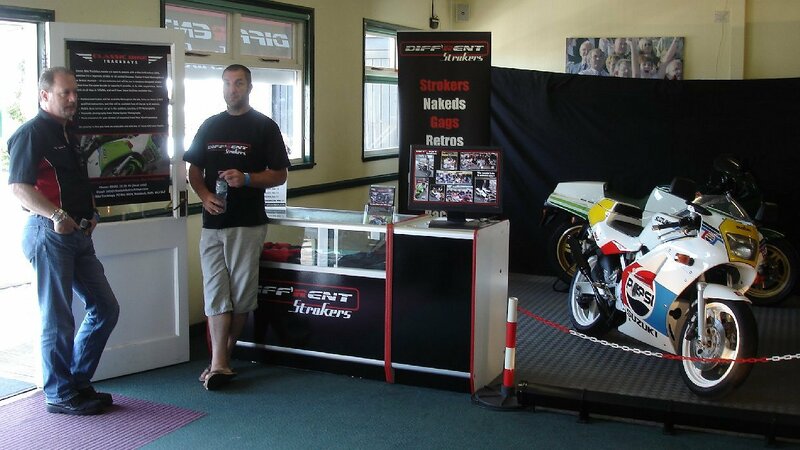 We've supported this show from the beginning and signed up for 2011 straight away. Six months before the show, we asked for ideas and volunteers on the forum and fairly quickly a theme suggested itself. 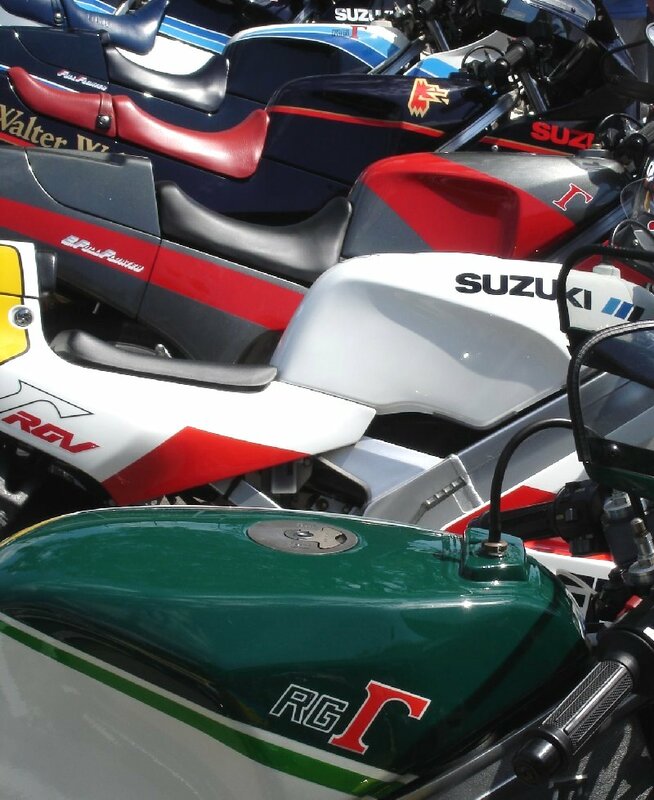 We seem to have become a home for quite a few RG250 owners recently (which we're very happy about) and a Gamma Frenzy was mentioned early on. 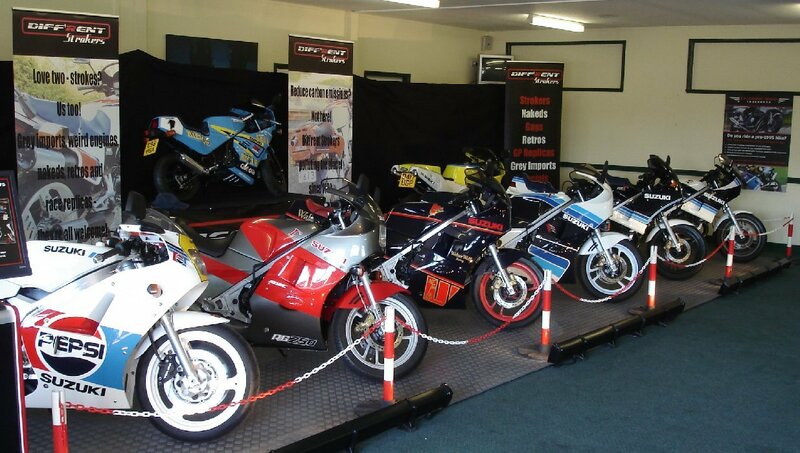 We always wanted the members to play a bigger part in the way things run so we took up the generous offers of bikes and stuck to that idea. 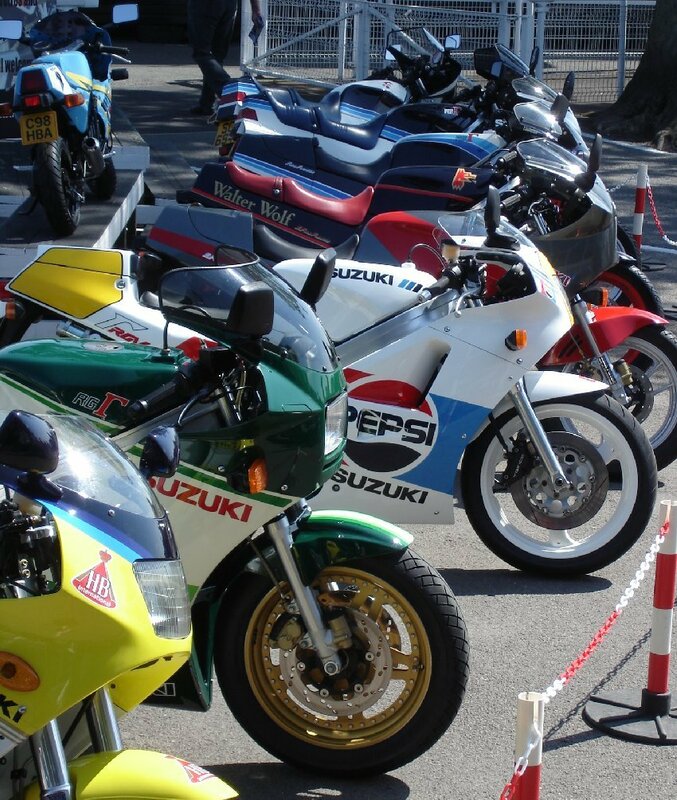 Three Mk.3 RG250's in different colours were offered so that was a great start. 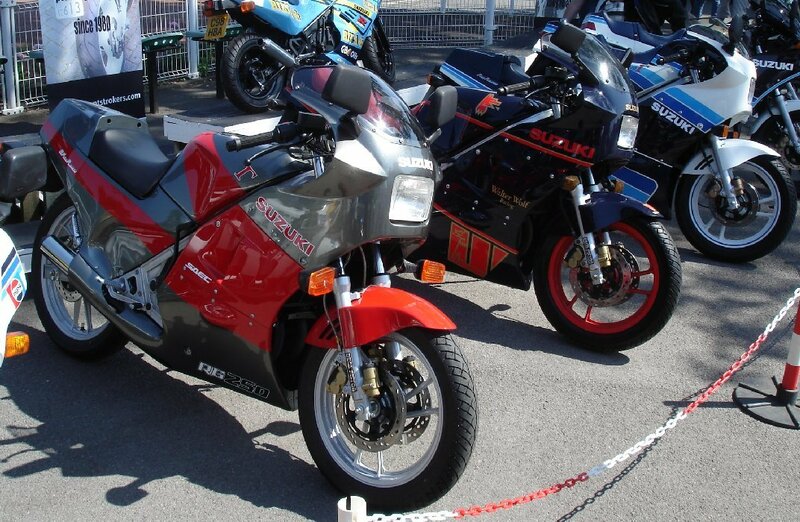 Gary brought his well-known white/blue one that we'd shown at Stafford last year, Darin brought his Walter Wolf model and new bloke Rob B managed to get his Japan-only red/grey one finished just in time. 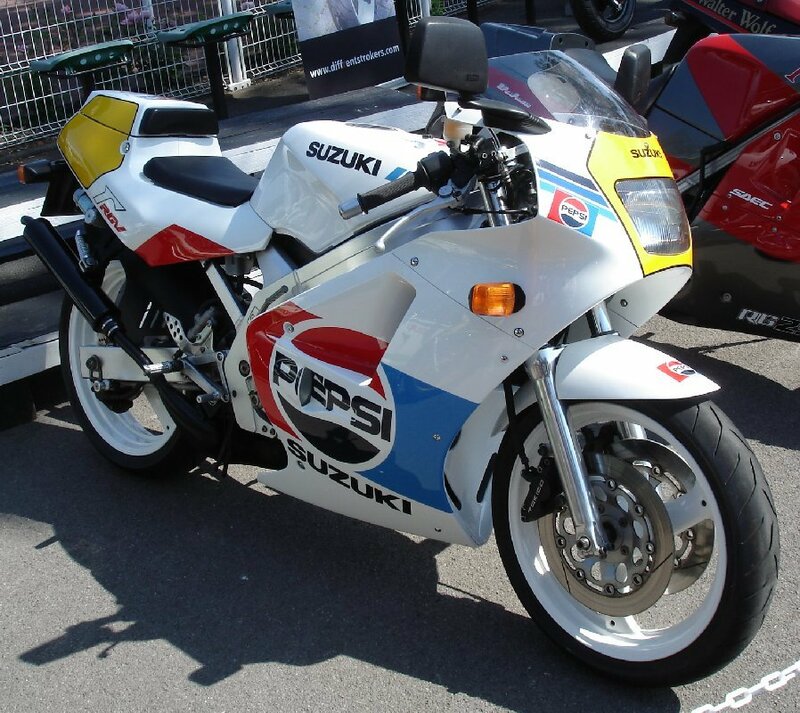 Bet no-one's seen one over here in those colours before ! 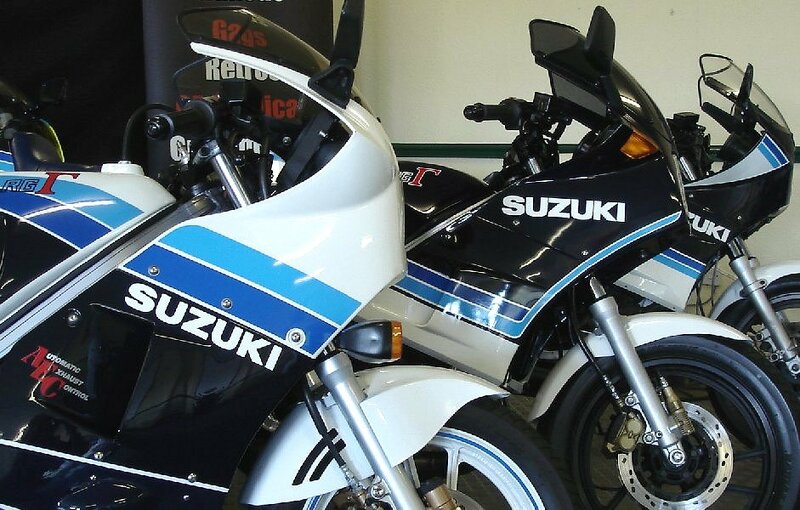 Rob E brought his Mk.1 Gamma along again and we managed to track down a Mk.2 in the Suzuki Owners Club that owner Stuart was happy to ride in on. He's quite pleased he did too as it was awarded a (richly deserved) Highly Commended rosette in the Best Suzuki category. 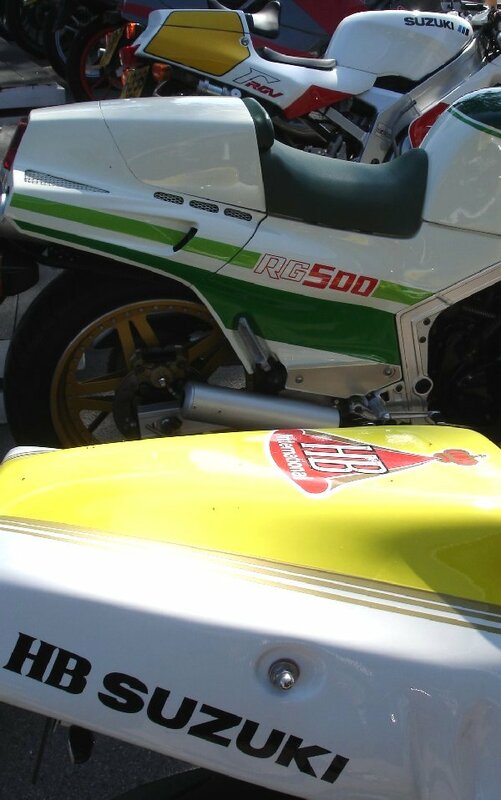 Also from the SOC, Carlos brought his Skoal Bandit-inspired RG500 along. 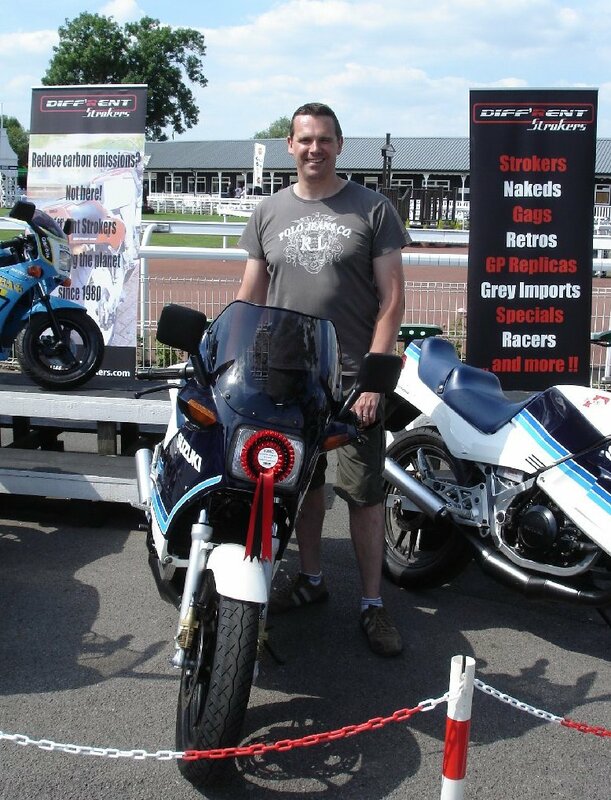 Both Stuart and Carlos demonstrated their bikes in the Saturday afternoon 'Sound-Off' feature, giving the club a plug over the PA at the same time. 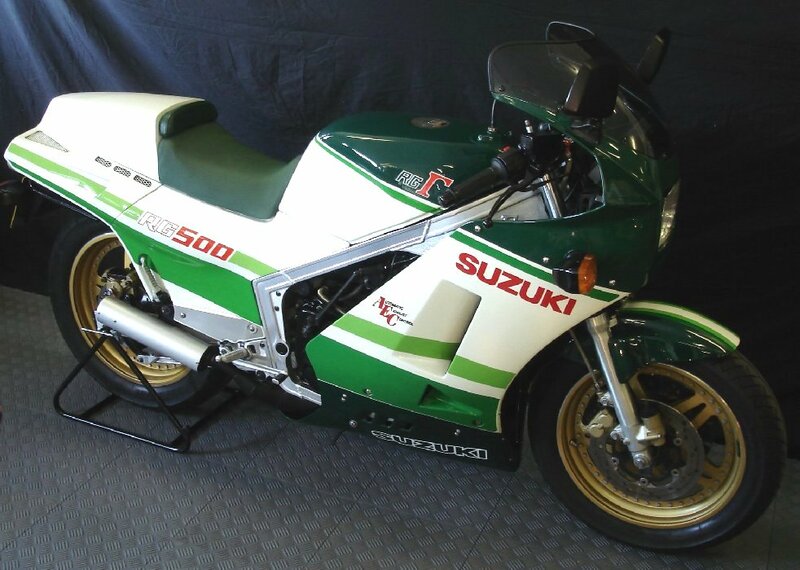 Nigel brought along a fearsome-looking RG500-based special which looked fantastic in HB colours and sounded even better. 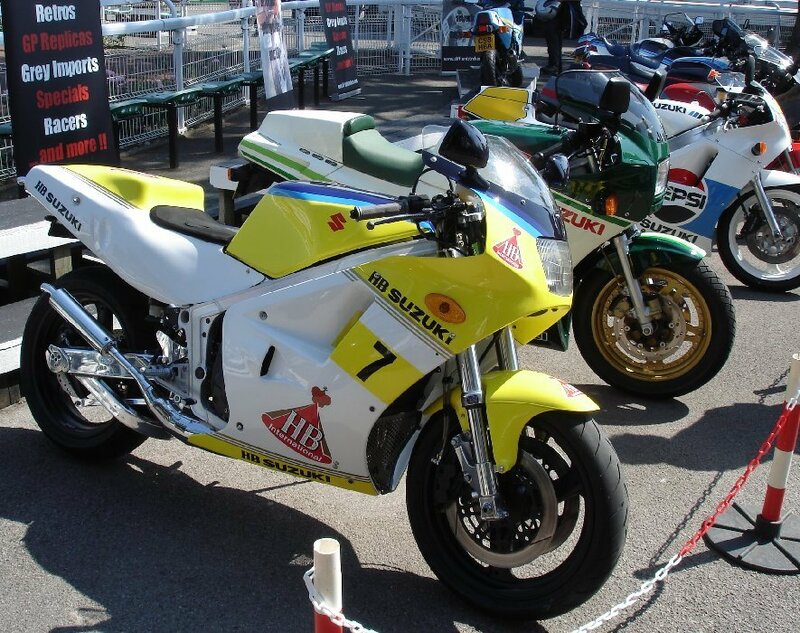 Despite being a four-stroke, Darin's Rizla RB50 was put on display too - a smart move as it always stops people in their tracks and generates interest. 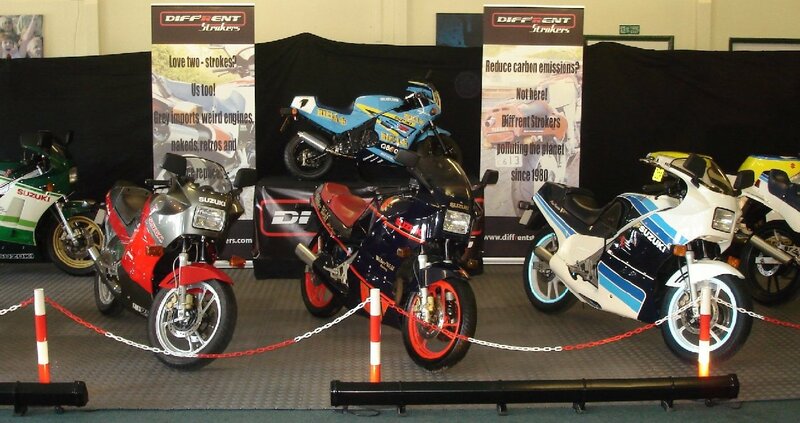 We'd planned to continue the Gamma-evolution display by including one of each model RGV too. Rob E brought his beautiful Pepsi VJ21 and we had a Lucky Strike VJ22 lined up which failed to materialise at the last minute. We couldn't track down a VJ23 either. None of this mattered, as the stand was nicely full as it was and the original idea was brilliantly executed. 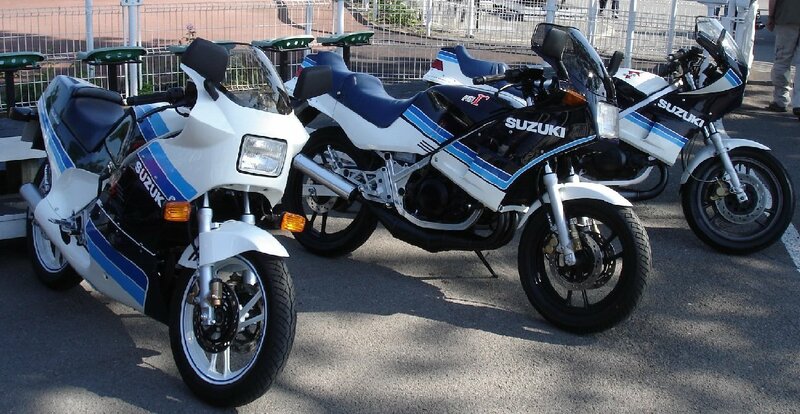 And yes, we know there was a Mk.4 RG250 but the differences are minor and only Gamma-anoraks know about them. And we couldn't find one. Saturday started quietly, and continued that way. You can always tell when the gates have opened to the public at 9:30 as a swarm of eager people rush in, completely overlook our display (and the others) in the pavilion and sweep straight through to the main hall. This time the swarm was more of a subdued buzz. 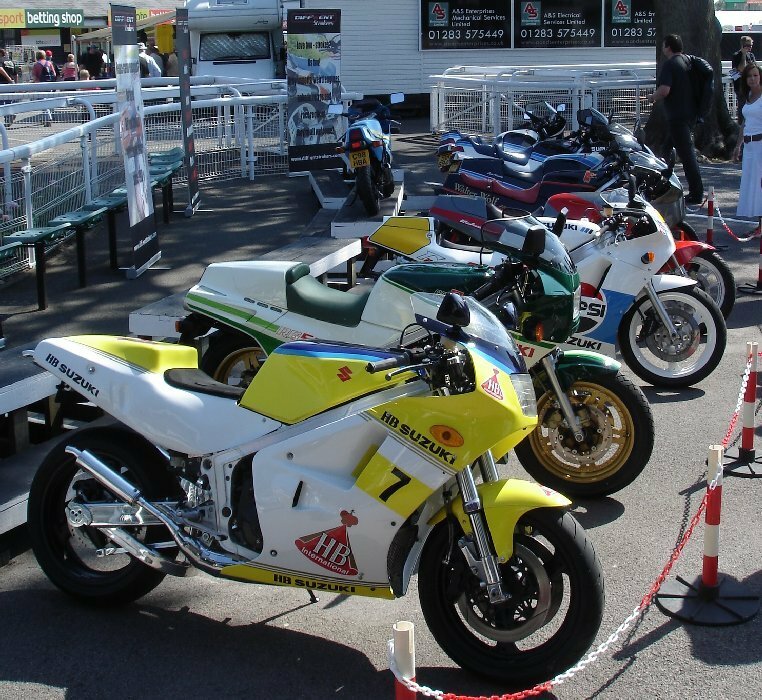 With little interest in our display, there was plenty of opportunity to explore the rest of the show, and time to chat with our friends on the other stands who were similarly underwhelmed with attention. It's not clear why this happened - the whole event organisation was contracted out to an independent expert this year and promotion was increased but so apparently were the fees paid by traders, which explains why the autojumble was so sparse. 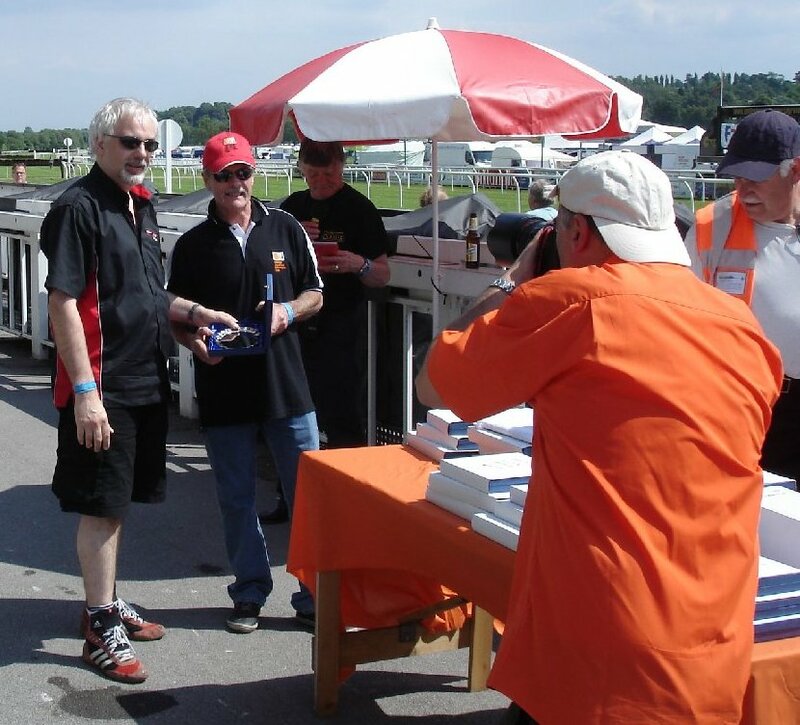 Tim continued his proud tradition of contributing nothing whatsoever to either the display or the running of the stand, but still managed to grab all the glory by getting Guest of Honour, four-times Grand Prix World Champion and close personal friend (has he mentioned that ?) 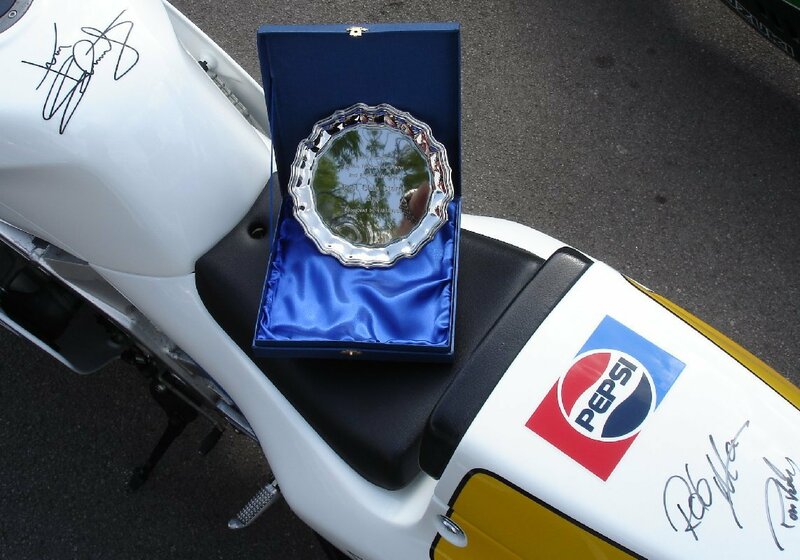 Kork Ballington to present him with the silver plate for 3rd Best Club Stand. Nice to see our efforts recognised by people who know what they're looking at. It's difficult to measure the 'success' of these things and in terms of attracting new members, selling T-shirts and talking to interested punters, it was undoubtedly a flop. But despite that (or maybe because of it), it was a very nice laid-back way to spend a couple of days in the sun. 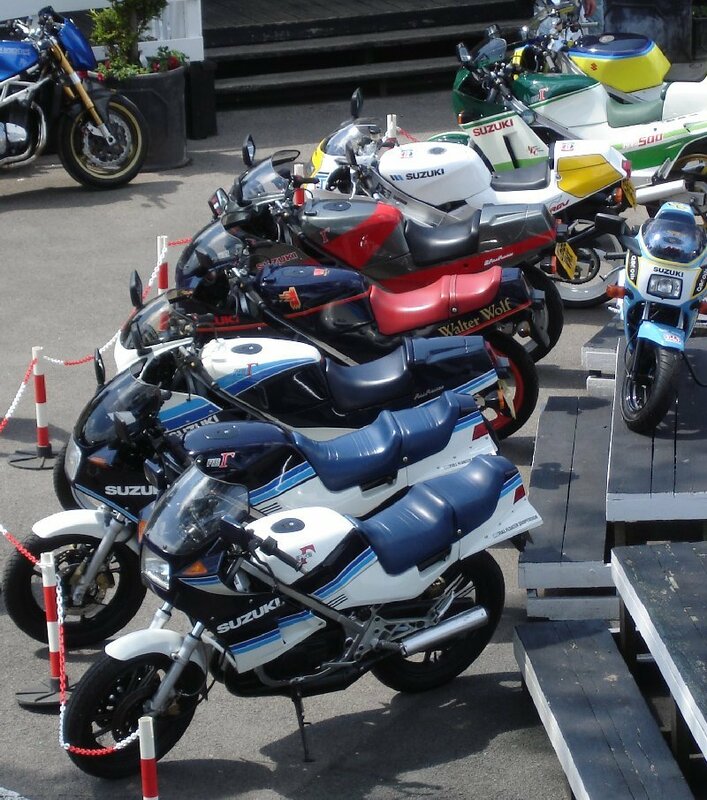 Thanks as usual to those who brought their bikes along, helped with setup, closedown and running things, popped by to say hello or otherwise helped make it a great weekend.